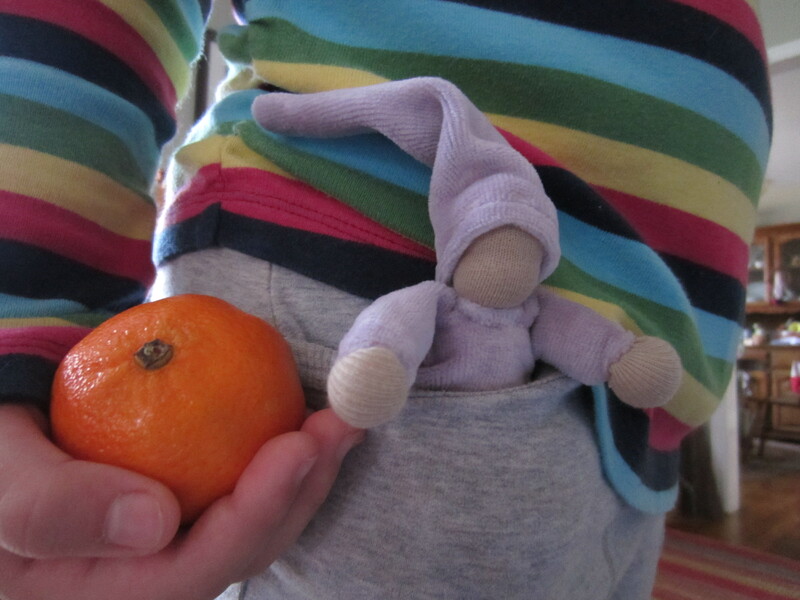 St. Nicholas left a little lavender doll and a clementine. 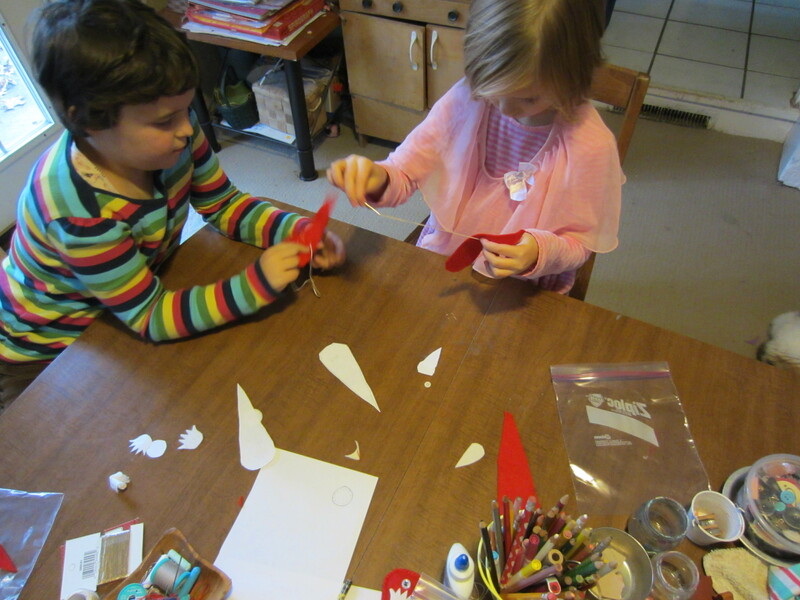 Santa’s helpers busy sewing ornaments. I found a great santa pattern at revoluzzza. My angel in the grade 3 class play at the Waldorf School of Atlanta. 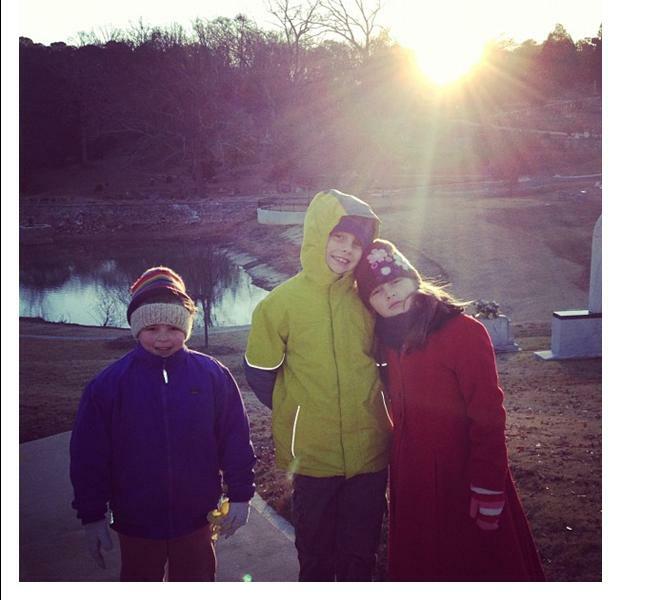 The sun greeted us as we celebrated the winter Solstice. 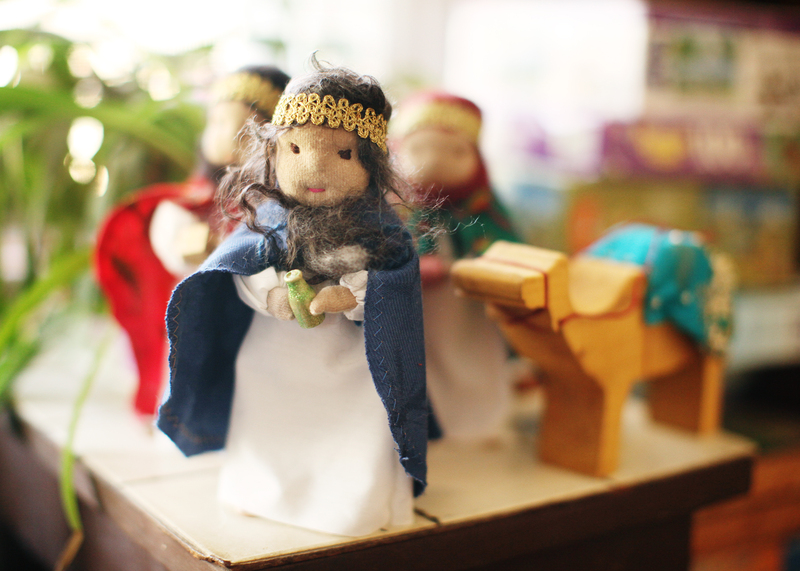 We so appreciated all the hard work that went into making our nativity characters last year. 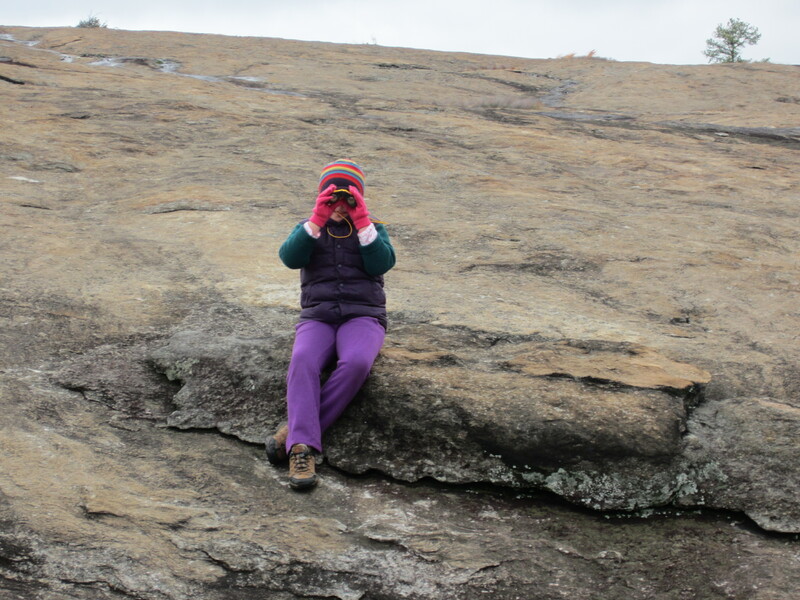 A cold and windy day on Arabia Mountain. The wise men followed a star, we followed a line of cars to the ABG Holiday Lights. And as soon as school started back, I finished my contribution to the Craft Hope Project 19. I had initially thought of writing this post about all the things we missed having the flu/cough over the holidays, but after looking through these photos, I realize that we indeed had a full holiday season! I’m grateful! according to m-w.com . . .
Well a little grey kitten was our epiphany today. We have Susan Jeffers’ Nutcracker and Stopping by Woods, so when I saw a copy of Silent Night illustrated by her at my favorite tag sale, I had to pick it up. Aside from showing a nursing newborn (yay! 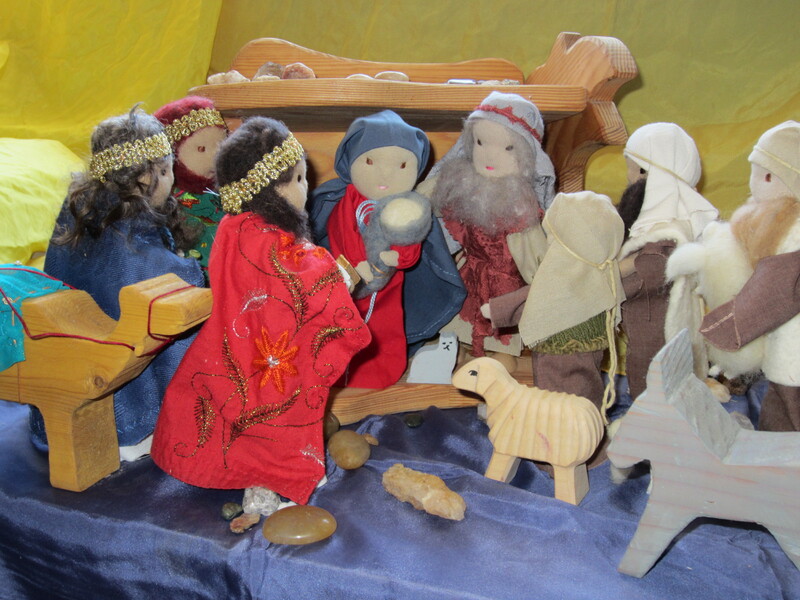 ), Jeffers has added a wonderfully cute kitten to the nativity story. If you are looking at the book on amazon, you can see the kitten in Mary’s arm on the cover of the paperback edition. Ivie and I had a great time finding the kitten in each of the nativity scenes. 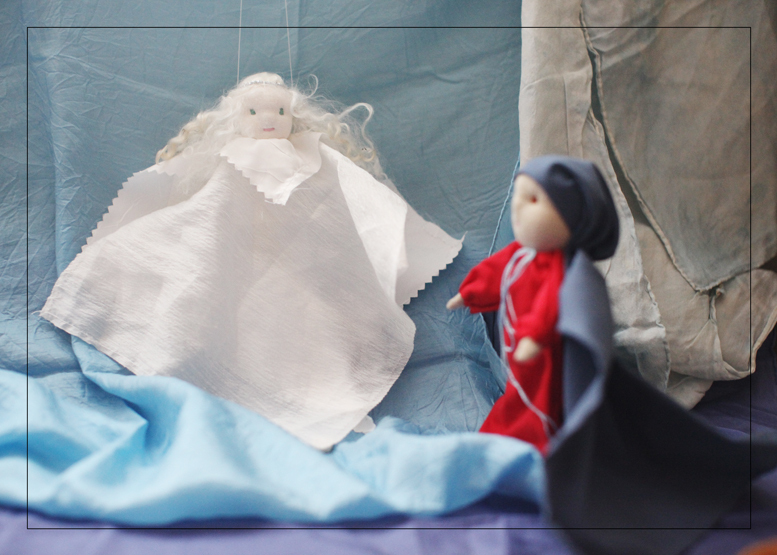 So of course, we had to add a little kitten to our nativity that you can see in the Epiphany photos I took today. This entire journey has been a process in learning . 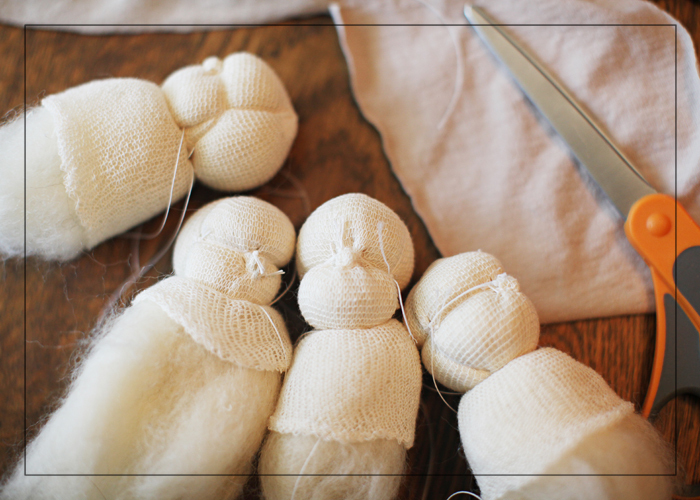 . . making a large quantity of dolls, blogging about it, keeping a photo chronology. I added one more learning opportunity for myself today by joining vimeo and making a little movie showing our journey with the dolls. Hope you enjoy! Journey to Bethlehem slide show on vimeo, click HERE. Today is the 12th day of Christmas and the Wise Men have traveled far (all around our living room) and are almost to the manger. They are ready to greet this special child with gifts. 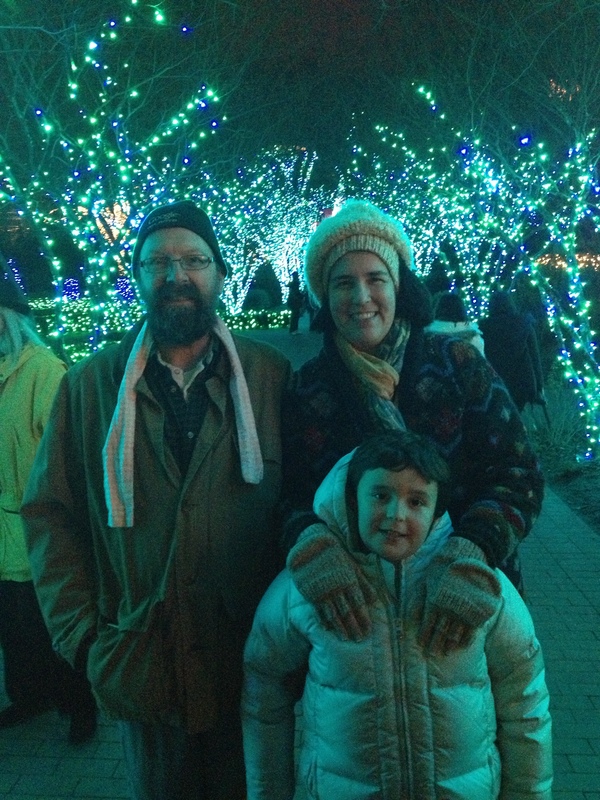 Tomorrow, I will post a photo chronology of our Journey To Bethlehem, but for today we will still enjoy our 12th Night. Congrats again to Cambre who won our Shepherd & Sheep giveaway! On this 4th Sunday of Advent we bring out the people. Joseph joins Mary in the journey to Bethlehem. The Shepherds tend their sheep and far away on a tall shelf across the room are the Wise Men. 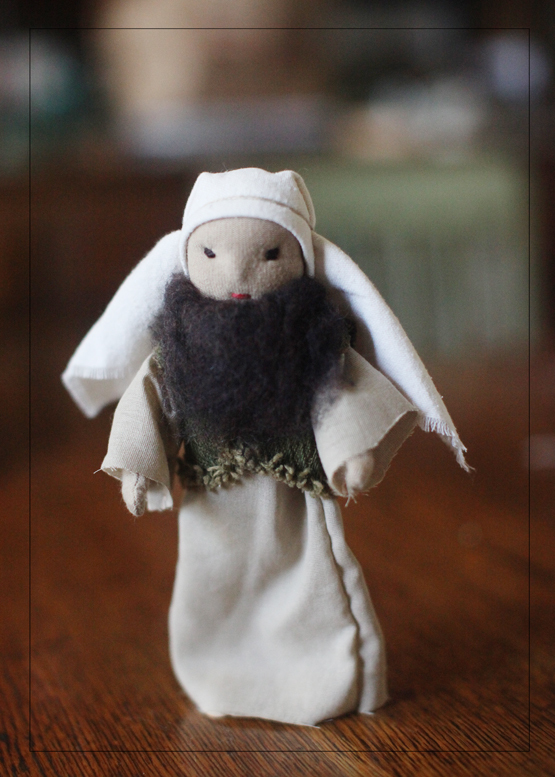 Watch for photos of the Wise Men and the rest of the figures next week. 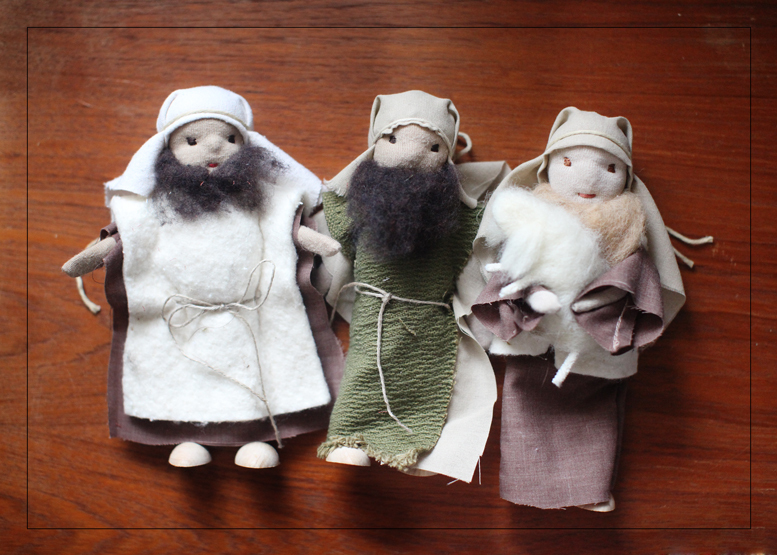 Well, we are not having a Shepherds’ Play at WSA this year, but I have found a wonderful story to use at home with our new nativity figures. All Year Round has a sweet story on page 301 called The Little Lamb (an advent story for children between four and ten years). 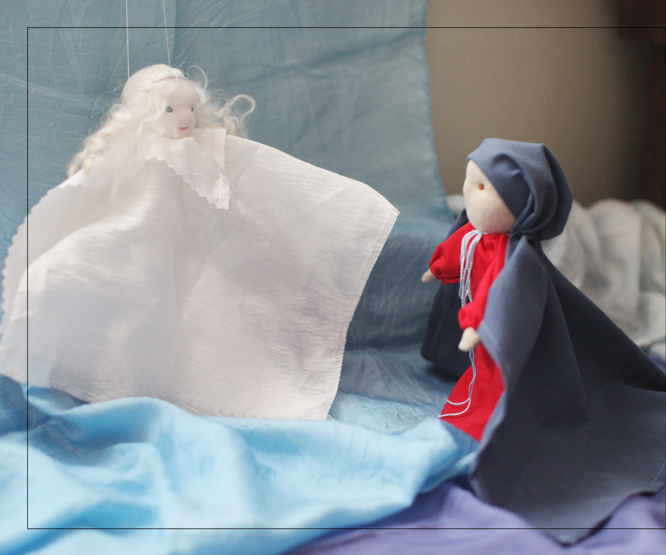 It tells the story of a young shepherd who goes out searching for a lost lamb and encounters a lady with a deep blue cloak and red gown who is preparing her son for his journey to Bethlehem. Lindsey got some great shepherd photos the other day. 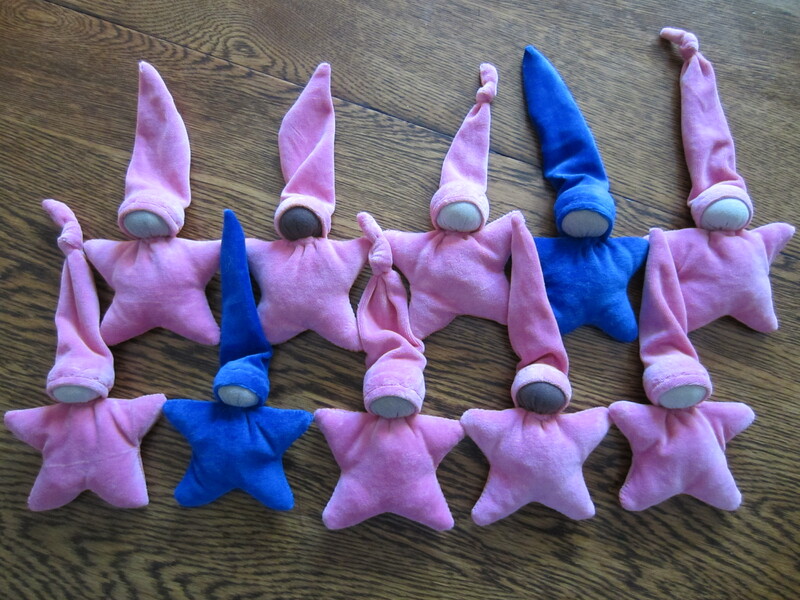 Remember, we promised one of these cute guys to you . 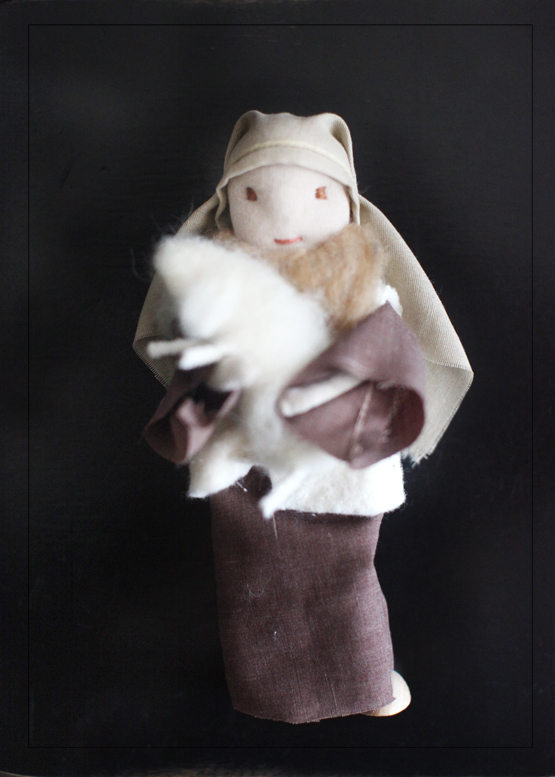 . .
We are going to giveaway of one of our shepherd figures and his little lamb. Just leave a comment here on this blog before Sunday, December 18th when we will draw the name of our lucky winner. The Annunciation to the Blessed Virgin Mary. 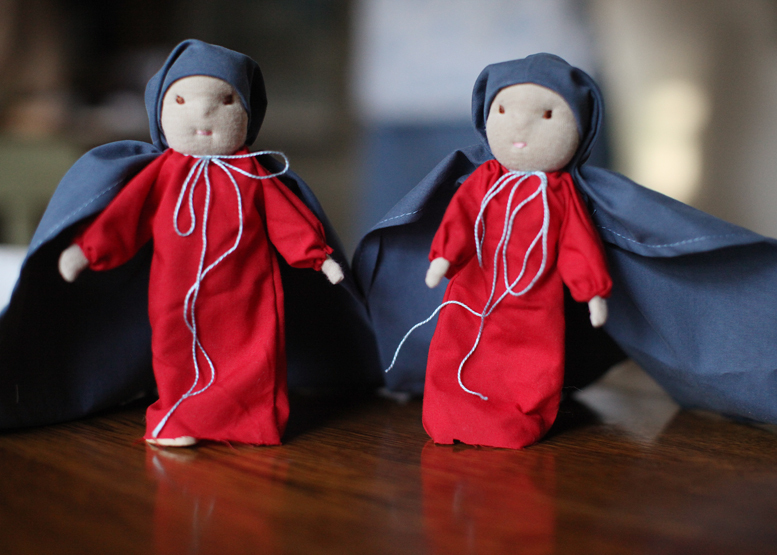 So as much as I might like to throw around the word annunciation on this blog. It is not the word I use when describing this event to my 7-year old. I don’t even use its etymological cousin, announcement. When we see Mary together with the Angel having a chat, we see Mary agree to take on this mantle. She decides to make this journey. She opts in to becoming the Queen of Heaven. After the busy & crowded nature table of late fall, we have enjoyed this first week of Advent with our table covered in a collection of blue silks and a few precious crystals and stones. It is a perfect time to focus on Mary and her making a choice to carry the light. 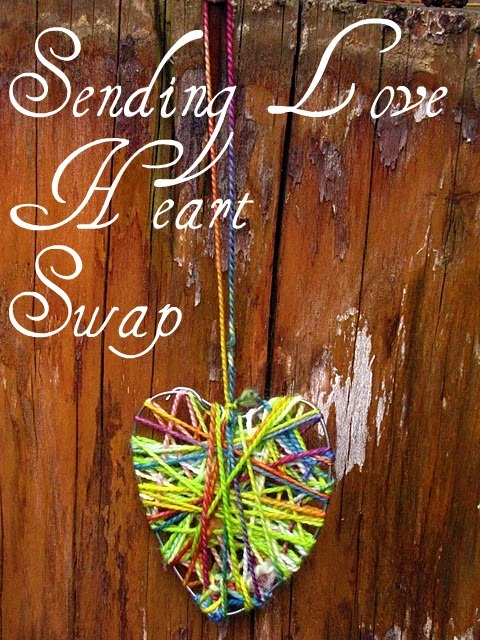 In this time of the year when it feels as if the light is slipping away, we can all choose to carry and share light. Tomorrow begins the second week of Advent and we will add things from the plant kingdom to our table. This will include our wooden stable, which is Mary’s destination for this trip. But for tonight, we will have Mary on her journey alone. Light that shines in crystals, in seashells, and in bones. The light of hope that we may see in greatest and in least. The light of love, the light of thought, to give and understand. It was Thanksgiving week. The first Sunday of Advent was just a few days away. Could we finish the Marys and the Angels to go out on our tables? Yes We Can! Two Angels coming to chat. 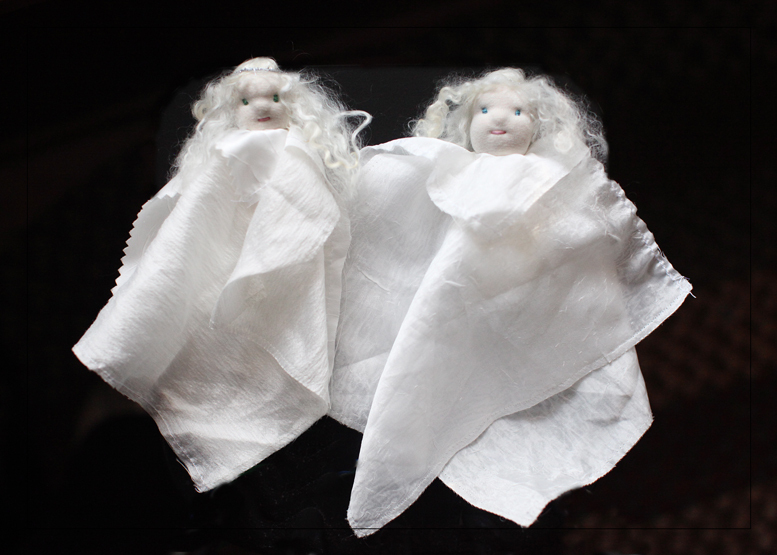 Mary and the Angel are ready to take their places on Sunday! Stay tuned for photos Lindsey took of the Annunciation. I take great liberties with the timing. The Josephs and all the Shepherds are finished. I plan to have the Wise Men finished by next week. We can just see the completion of this huge project we began almost a year ago!